Last week, the Ketner Group team attended the PRSA 2018 International Conference, better known to the public relations community as PRSA ICON, in our own backyard here in Austin, Texas. If you are not familiar with the conference, it’s designed specifically to help the communications community enhance our personal and professional network through career development and connecting with other PR practitioners. Although as communication professionals we may think we are clearly delivering our messages, that may not always be the case. As we learned at the conference, we currently live in the age where content is king, but that can lead to a vicious cycle of “churning and burning” an immense amount of content, losing sight of one key component: your target audience. For example, think of a scenario where someone is just talking at you, instead of trying to understand what experiences or topics may be relevant to you based on your experiences and former knowledge – chances are, mid-lecture your mind will start drifting away to more relevant thoughts. Therefore, your audience should always be at the forefront of the message. Key questions like ‘what is my audience’s point of reference?’ and ‘why would this be relevant to them?’ and ‘what does my audience need?’ should always lead your messaging strategy. After all, if you lose your audience, who is going to read your content? As industry conversations continue to heat up on the effectiveness of social media influencers, the fact is, social influencers are now and will continue to be a staple in the world of communications. (Ketner Group recently profiled one such influencer in a recent blog!) What’s more, social media influencers can help companies effectively grow organic audiences and customers they would not have had before. 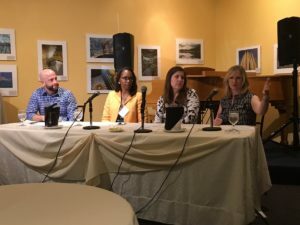 As we learned at PRSA ICON, leveraging social media influencers for your communication efforts is a matter of conducting diligent research to identify the right influencers that will create a new level of authentic communication between you and your target audience. As Dr. Seuss once wrote, “The more that you learn, the more places you’ll go.” And in public relations and communications as a whole, there is something new to learn every day! We look forward to implementing the lessons learned at this year’s conference into our communications craft as we continue to be life-long learners in this industry. We just wanted to give a shout-out to our Director of Company Branding, Caitlin New, as she’s featured as the Public Relations Society of America’s Austin Chapter member of the month for January. Caitlin is currently serving on the PRSA Austin board as Programs Chair, and is also on the planning committee for the PRSA Southwest District Conference (June 5-7) as the Special Events Chair. Check out her member spotlight article here!